Jimmy Smyth was born in Ruan, County Clare in 1931. He was born into a family that had a strong association with the game of hurling. His uncle played with Clare while his mother was also a hurling enthusiast. He was educated locally and later attended St. Flannan's College, a virtual nursery for young hurlers. Here he won three Harty Cup titles and three All-Ireland Colleges' medals in the 1940s. In his teens Jimmy started playing for his local club in Ruan and enjoyed much success. He won his first senior county title with the club in 1948. Not only was it Smyth's first county victory but it was also the first time that Ruan had triumphed in the county championship. He captured four more county medals in 1951, 1959, 1960 and 1962. A skilful hurler from the age of 13 Jimmy quickly attracted the attention of the Clare minor hurling selectors. In all he played at minor level for a record five years, where the junior and senior management teams noticed him. He played his first inter-county match in the National Hurling League at the age of 17. In the mid-1950s he earned his reputation with the Clare senior hurlers. In 1953 he scored a record 6-4 in the Munster Championship. The following year, 1954, Clare defeated Wexford to capture their first ever Oireachtas title. In 1955 Clare showed their confidence by defeating the All-Ireland champions Cork in the first round of the Munster Championship, however, Clare themselves were later defeated by Limerick. Jimmy also lined out with Munster in the inter-provincial hurling competition and enjoyed much success playing alongside hurling legends like John Doyle, Christy Ring, Tom Cheasty and Jimmy Doyle.. 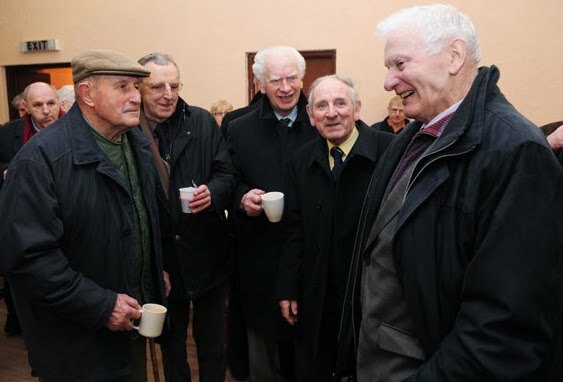 He won his first Railway Cup medal in 1952 in his first year on the team as Munster defeated Connacht. Three years later in 1955 Smyth captured a second Railway Cup title. The late 1950s and early 1960s saw Smyth enjoy even more success as Munster came to dominate the inter-provincial series of games. He won five Railway Cup medals in-a-row in 1957, 1958, 1959, 1960 and 1961. Smyth captured his eighth and final Railway Cup title in 1963. This is the first team that he played on. Team: Tony Reddan (Tipperary), Jackie Goode, Davy Walsh (Waterford), John Doyle (Tipperary), Sean Herbert (Limerick), Pat Stakelum (Captain, Tipperary), Matt Fuohy (Cork), Phil Shanahan (Tipperary), John Kiely (Waterford), Matt Nugent (Clare), Mick Ryan, Seamus Bannon, Paddy Kenny (Tipperary), Derry McCarthy (Limerick), Christy Ring (Cork), Eddie Stokes (Limerick), Jimmy Smyth (Clare), Jimmy Finn (Tipperary), Donal Broderick (Limerick), Ned Ryan (Tipperary). In 1967 Jimmy Smyth retired from hurling having given two decades to the game at the highest level. “Munster Hurling Team of the Millennium” in 2000. He adds: ‘I only remember what happened immediately after the game. We togged out in the Queen’s Hotel, approximately 600 yards from Cusack Park. We walked to the Park. At the sideline gate leaving the pitch I was approached by an elderly lady from Ruan, my home parish. She smiled into my face, and caught me by the back of the jersey. She never spoke a word. And still without a word, she walked on by my side to the Queen’s Hotel doorway, with her hand still on my jersey, when she again smiled into my face and then walked silently and smilingly away’. Hugh Brady, principal teacher at the Ruan National School was born ca. 1844 and died on October 29th 1918 at the age of 75 years at Paradise Hill, Ballynacally, Co.Clare, whither he had gone to reside shortly after his superannuation in 1909. He was buried on October 31st 1918 at the family burying ground in Kilchreest. Requiem Mass was chanted for him at the parish church of Ballycorick. The funeral was an immense one. All the local clergy were present. Hugh Brady had for several years been one of the most widely known men in County Clare. He taught in Kildysart and Ballinruan and was still a very young man when appointed to the school in Ruan. He had already achieved fame in the early 1870s as a coach for the Civil Service examinations, becoming well known across the whole of the United Kingdom for his successes in that capacity. The name of Ruan became a scholastic talisman and pupils came from all over Munster to study at Hugh Brady's academy. At a celebration in his honour in 1909 Mr George Greene said “The name of Mr Brady is known in every seaport, in most of the principal distilleries and breweries, and indeed in nearly all Government offices of the United Kingdom”. Hugh Brady's pupils occupied senior Customs & Excise positions across the Empire. Thus Pat Flanagan of Crusheen became Collector in Birmingham, one of the largest cities in that country, Pat O'Brien of Ruan became deputy chief inspector of Customs & Excise at Custom House in London, John Casey of Moyrhee in Tubber became the head of Customs & Excise in Perth in Scotland, and the Honourable Patrick Carmody, one time of the Government Laboratory in London and subsequently posted to the West Indies was another of his distinguished pupils. His former pupils also included Archbishop Dr Patrick Clune of Perth, Australia; Benjamin Kidd, author of the book “Social Evolution” which was translated into numerous languages; and the renowned athlete John Purcell who went to America in the 1880s. Hugh Brady was said to have excelled at mathematics and languages which included Latin, Greek, French, Gaelic and – in his own words – a smattering of German. The Commissioners of National Education in Ireland: forty-third report, 1876, with appendices mentions Hugh Brady in an appendix relating to Carlisle and Blake Fund premiums in the years 1875-76 and 1876-77. These premiums were awarded to the most meritorious teachers of the group of school districts under the superintendence of each of the six head inspectors. Hugh Brady of Ruan received £4 in 1875. Hugh Brady was a strong supporter of the Gaelic movement and a great admirer of the statesmanship and patriotism of Parnell. The Gaelic League (Conradh na Gaeilge) was founded in the Dublin academy of one of his pupils, Martin Kelly of Dysert, who became deputy Registrar of the Chancery Court and a civil servant in the Four Courts. In his book “Reminiscences of a Country Boy” Mr George O'Donnell of Ruan described him as “....a remarkable figure and a still more remarkable character. Slightly under 6 feet in height, symmetrically proportioned, agile and resilient in movement, wearing a nicely trimmed beard, and with eyes of tremendous and devastating power. Sir Michael O’Loghlen was a distinguished Irish judge and the first Catholic to occupy a seat on the Bench since 1688. He was born in October 1789 in Port, Ruan Co. Clare, the third son of Colman O’Loghlen and his second wife, Susannah Finucane. The O'Loghlens were descended from the princes of Corcomroe, in the Burren. The inscription reads; This statue of the Right Honourable Sir Michael O’Loghlen, Bart., Master of the Rolls, was erected in this his native county by his friends and admirers, as a tribute to his memory, and as a mark to future ages of their due appreciation of his public talents and private worth. Michael O’Loghlen was educated in Trinity College, Dublin and was called to the Irish Bar in 1811. In 1817 he married Bidelia Kelly from Dublin. They had four sons, Colman, Hugh, Bryan and Michael and four daughters, Maria, Susan, Bidelia and Lucy. In 1815 Sir Michael was junior counsel to Daniel O'Connell and had to defend a case in the Court of Chancery when O’Connell was absent following a duel with D’Esterre. O’Loghlen successfully defended the case and received warm congratulations from O’Connell. He insisted that O’Loghlens name be endorsed on the back of every brief sent to O’Connell as senior counsel. In 1834 he became Solicitor General of Ireland and was elected MP for the borough of Dungarvan. He brought in the O’Loghlen Act for the Suppression of Drunkenness, which cleared the way for Fr. Mathew’s temperance movement. In 1835 became Attorney General and was elevated to the Irish Bench as Baron of the Exchequer in 1836. He relinquished this office the following year on being appointed Master of the Rolls. In July 1838 he was created a baronet. He is credited with several legal improvements, including a consolidation of the Grand Jury Laws. CLUNE, PATRICK JOSEPH (1864-1935), archbishop, was born on 6 January 1864 near Ruan, County Clare, Ireland, son of James Clune and his wife Margaret, née Lynch. Educated locally and at St Flannan's College, Ennis, in 1879 he entered the Catholic Missionary College of All Hallows, Dublin, to study for the priesthood and was ordained in 1886 at the early age of 22. His first appointment was to St Patrick's College, Goulburn, New South Wales, where he taught English literature and developed a love for it which always influenced his style of public speaking. He was later the administrator of the Goulburn cathedral until his return to England to train as a Redemptorist missioner in 1893. On a visit to Ireland in 1920 he was deeply shocked by the outrages perpetrated by the 'Black and Tans' in the name of the British government. In London he was invited by influential people to negotiate between the British government and the Irish Sinn Fein leaders; he conferred with Lloyd George and members of his cabinet and travelled between London and Dublin for several weeks, conveying the cabinet's terms to the Irish leaders and their replies to Lloyd George. The prime minister was reported as approving cordially of Clune's support for a temporary truce; but the 'Tory Wing of the Cabinet and especially Mr. Bonar Law and Mr. Winston Churchill' were opposed 'unless the Sinn Feiners delivered up all their arms': the negotiations failed on this question. In Paris in January 1921, on his way to Rome, Clune stated publicly that he believed Lloyd George 'sincerely yearned for peace', but unhappily several members of his government and other politicians did not share this view; he described the Sinn Feiners as 'the cream of their race'. Clune's work for peace aroused public awareness in Europe and the United States of America as to the true state of Irish affairs, and in a speech at his official welcome back to Perth, he spoke fully and frankly of what he had seen in Ireland. Many in Australia had known only the partial reports of the newspapers, and also seemed to believe that 'loyalty' consisted in exhibiting conditioned reactions based on the English class system. The governor of Western Australia, under the restrictions of his office, made no public statement. However, he had failed to have the Colonial Office intervene to delay Clune's return, and he promptly denounced Clune's speech to Downing Street as likely to revive bitterness all over Australia. The governor, blind to the significance of Clune's role, even as an Australian, but aware of his reputation for moderation, feared his 'full influence with the Roman Catholic Community'. Clune now developed his expanding archdiocese: between 1921 and 1931 fifty-six new buildings were erected, including the foundling home at Subiaco, a home for the aged at Glendalough and a school for mentally handicapped boys at Castledare. Helped by Dr J. T. McMahon he supported the establishment of the 'Bushies' Scheme' in 1923, for the religious education of children in isolated areas, and the Newman Society of Western Australia, founded in 1925, for Catholic university students and undergraduates. Clune will be well remembered for the building of the beautiful present sanctuary and transept of St Mary's Cathedral for which he made the appeal for funds. The completed portion, opened on 4 May 1930, owed much to his taste and care. In 1933 he chose as his coadjutor Redmond Prenderville who took over much of the administration as Archbishop Clune suffered from increasing infirmities. His last public speech indicated his dual interests: the Church he said, 'was striving to teach two things—truth and beauty'. He died on 24 May 1935 and was buried simply in the Redemptorist plot at Karrakatta cemetery. Glowing tributes were paid to his memory by prominent citizens of all religious beliefs who felt that his tolerance had contributed materially to Perth's lack of 'rancorous religious controversy'. A public-spirited citizen, Clune had been a peerless orator and a man of peace with a genius for making friends. Sir Walter Murdock found him 'never an austere recluse', full of 'unaffected geniality' and with a conversation which was 'particularly witty and stimulating'; and Rabbi Feldman said that 'he held the respect of … the Jewish community [and] maintained peace in his time'.